The women’s case was subject to various delaying and secrecy tactics by the police. One of these tactics was “Neither Confirm Nor Deny” (known as NCND). They are now attempting to use NCND to avoid accountability in the Public Inquiry into Undercover Policing. We have published a briefing on NCND that you can read here. The police say that they have a ‘policy’ of NCND in relation to undercover officers. If anyone asks whether one of their officers is an undercover, they reply with words to the effect of “We can neither confirm nor deny that X person was an undercover officer”. But NCND doesn’t have any legal standing. It doesn’t even seem to be a ‘policy’ – no evidence has been presented of a written policy – only “witness statements” have been produced, where the witnesses claim that the ‘policy’ is longstanding. In some instances police lawyers have referred to it only as a ‘practice’. Despite this, and despite the very serious nature of the many allegations against undercover units (both as part of this case and beyond), NCND comes up again and again. March 20, 2016: Open Inquiry, Open Justice – the victims of all the different abuses perpretrated by undercover police make a joint submission to the public inquiry, pulling NCND apart, saying it has “no role to play” in the Inquiry, and requesting that the Chair make the use NCND itself part of the Inquiry. (Hearing on 22-23 March, decision expected April 2016). March 14, 2016: Secrets Beyond Lies – police request that they hide behind NCND in the coming Public Inquiry, and shockingly the Home Office gives them back-up. Still only witness statements are brought as ‘evidence’ of NCND as purported ‘policy’. This briefing breaks down the police’s bids for secrecy. March 9, 2016: Helen Steel confronts former undercover John Dines, who the Met have consistently hid behind NCND – showing how NCND protects those who go on to train new recruits worldwide, while remaining unaccountable for the abuses they perpetrated. August 14, 2014: Women win partial victory against NCND – Metropolitan Police confirm identity of undercover officers following legal challenge by women. The judgment by Mr Justice Bean stated the police could no longer rely on their purported policy of “Neither Confirm Nor Deny” (NCND) in respect of two of the four officers named by the Claimants. Women issue full statement outlining the implications of the judgment. May 28, 2014: Explanation of the women’s upcoming legal challenge to NCND – see also Alison’s article. At the hearing in June, holes appeared in the Met’s wall of secrecy and unaccountability over relationships; judgment was issued later that August (see above) giving the women partial victory over NCND. March 21, 2014: Deceived women seek end to police cover up : the women’s solicitors applied to court to force the police to stop hiding behind NCND and to fulfill their legal obligations in the case. March 20, 2014: Briefing: Absurdity and Inconsistency of “NCND”: How senior officers, right up to the Met Commissioner Hogan-Howe himself, and Sir Hugh Orde of ACPO (both speaking in 2011), didn’t seem to be aware of NCND – until it suited them, later on, to “remember” NCND (as a useful tool to obstruct justice). March 18, 2014: Women condemn ongoing police obstructions to legal case : the police dropped their strike out application, yet clung to NCND, obstructing the progression of the case against them. March 6, 2014: Why “Neither Confirm Nor Deny” should not stand: Critique of NCND in March 2014, in response to the police attempts to get the women’s case struck out on the basis of the NCND ‘policy’. August 30, 2013“Neither Confirm Nor Deny” practice criticised : Describing the release of documents in August 2013 from the women’s solicitors outlining key concerns over NCND. These concerns were expressed after the women chose not to cooperate with Operation Herne (the police inquiry into undercover officers) because of police secrecy. 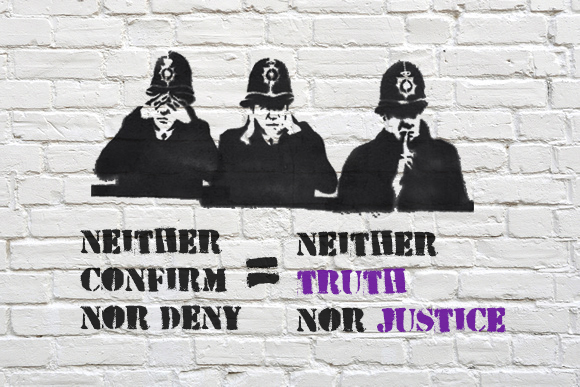 Neither Truth Nor Justice : Piece from Bristling Badger blog on 11/3/14 about the ‘farcical stonewalling’ of the police using NCND. ‘Neither Confirm Nor Deny’ my arse : Article from direct action news service Schnews on 13/3/14, criticising NCND. Prosecutors ‘behaving ludicrously’ in case of alleged undercover officer : NCND criticised in case where undercover officer used false identity under oath; article from The Guardian on 27/1/14. Why I’m fighting the Met in court over undercover relationships : Article by Alison, one of the women in this case, giving the background to her legal fight and criticising NCND. Published by The Guardian on 3/6/14. Radiolab: Neither Confirm Nor Deny : Piece from US radio on the origins of the phrase ‘Neither Confirm Nor Deny’, from military forces to celebrity haircuts; how it’s been used to delay Freedom of Information requests and to disrupt democratic accountability – and how it has caused distress to those caught in the crossfire of government secrecy.